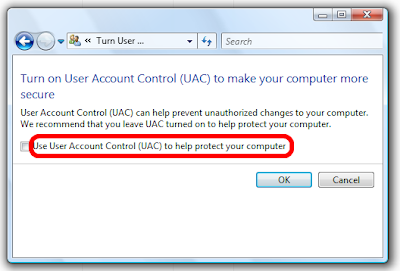 The most annoying feature of Windows Vista is User Access Control (UAC) Popups. Even though Microsoft says that UAC is for the benefit of users, most of the Vista users are not comfortable with approving endless UAC dialogs. Here is a funny Apple commercial PC vs Mac - Vista Security. I believe most of the people who used Vista accepts what is shown in the commercial - UAC is really annoying!! 3. 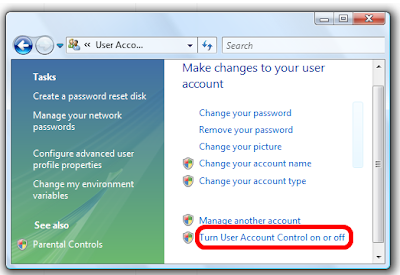 Click on Turn User Access Control on or off. Vista display UAC dialog box; click on Continue. 5.Now Vista prompts you to restart the computer for disabling UAC. Restart the computer.